A musical play by Stephen Nash and Jan Lester-George. Recorded in Steeple Aston Village Hall on 24th February 2011. Wind in the Roses is a new musical play that recalls life in Bethnal Green during the last World War. It includes a lot of contemporary wartime songs, the words for many of which were in the programme. Stephen Nash, on whose ideas the play is based, wanted to remind us if we were old enough, or to explain if not, about both the wartime suffering and the spirit it created. He wanted those who are too young to remember and especially children to understand. The play is dedicated to the people of Bethnal Green who were involved in the awful Tube Disaster in 1943. There was a rush for shelter in the Underground Station during an air raid. A woman carrying a child tripped on the stairs, others tripped over her and many of those following fell on top of those who had already fallen. In total 173 people died. 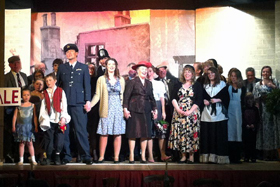 There was a collection after the play towards a permanent memorial to the victims and £245 was raised. For more photos of the show, please click here. With thanks to the Steeple Aston website for allowing us to reproduce this article.